What's cuter than a baby picture? Aw.... the widdle cutie pie! Sooooo sweet! Here's the proud mama, the daughter of the first hybrid I ever made, a cross between the wonderful native US swamp rose, Rosa palustris and a beautiful rugosa rose hybrid called 'Apart'. She's an incredibly tough little lady, a vigorous, incredibly thorny bush that laughs at disease and, thanks to the fact her grandmother lived in a bog, thrives in heavy, poorly drained clay soil. In contrast to her tough-as-nails constitution, all summer long she unveils these delicate, fragrant, exquisitely crafted flowers that I adore. This is the daddy, the classic, and classy, rose 'Golden Wings' one of my favorites with pale yellow blooms on a large, vigorous bush. I'm so proud to welcome their first child into the world! More should be popping up soon, and I can't wait to see what they look like and how they grow. So much beauty and anticipation packed into a tiny speck of green! I'm always going on about plant breeding. I love it. It is a blast. I'm writing a book about it. It is also sometimes incredibly easy, as easy as letting violas self sow and picking out your favorites as they bloom. To see how much fun (and how lovely) that can be, go check out Faire Garden's gorgeous (and amusing) Viola Beauty Pageant. Anything with some variability that self-sows in your garden -- be they violas, columbine, or even lettuce -- can be treated the same way to create your very own strain. Collect some up, let them get down and dirty together, and pick out your favorites! I try lots of new plants every year. It is one of my favorite things about gardening, so I thought I'd share some of my very favorites of 2011. Not all of them new in my garden this past year, but simply things that made an impression on me. I've talked about these before, and I'll keep talking about them because I can't believe so few people grow them. Fully winter hardy, amazing range of forms and colors. Don't think you have to limit yourself to the boring not-very-hardy cushion mums from the big box store, or the few hardy, daisy-form varieties that are more widely available. Sheffield Pink and Will's Wonderful are great, but why stop there when you can ALSO have something like Peach Centerpiece? Get them all from Faribault Growers. Oh, and in my original post I didn't give a great review of 'Matchsticks'. Well, that was because I hadn't been patient enough. Early in their development, the flowers are okay, but once the open fully, they are stunning as seen in the image above. I'm a huge fan of basically all kale, but this beatiful and incredibly diverse mix of kales won my heart. Actually a fascinating hybrid of different brassica species rather than a regular kale, the result is masses of frilly, slightly spicy leaves on robust plants I harvested from constantly the entire summer. Any vegetable that combines easy of growth, great flavor, and beauty is a winner in my book. As far as I know, available exclusively from Adaptive Seeds, which is a crazy cool source for crazy cool veggies you should really check out. Previously mentioned in the blog, I love this plant. So clearly a salvia, and yet so unlike any salvia I've ever grown. This is my first year with if from seed (it was completely easy to germinate and grow, by the way) and it started out as a rosette of gloriously big, bold, textured foliage. Usually, when a plant starts as a rosette, it stretches out dramatically into a big leafy pillar when it flowers, but this one is different. The leaves stay nice and compact at the bottom, and up goes a tall (almost 4 foot), slender, leafless stem topped with an utterly charming upside-down cluster of lavender flowers. I could see this being stunning in the front of a mixed border, the basal leaves looking great at ground level, and the dancing flowers making a wonderful see-through effect like the always great Verbena bonariensis. I got mine from Gardens North. When it comes to fall blooming crocuses, I'd pretty much written them off several years ago when I tried – and failed spectacularly with -- Crocus sativus, the saffron crocus. It hates my cold, wet garden and promptly died. But in the fall of 2010, I decided to give this group another try, and this time planted Crocus speciosus. It bloomed that first fall, which was nice, but I more-or-less expected it to rot out in the wet of winter and spring. To my surpise, and delight, however, it showed up happy and more numerous in my garden this fall! The large blooms are wonderful, and such a lovely contrast to the red and yellow tones that dominate that time of year. I was also impressed with the length of the bloom season – flower after flower opening for quite a few weeks. I'll certainly be adding more to the garden in future years. I've grown this for several years now, and I love it more every year. People seem to love or hate it – brown is a wonderfully strange color for a grass, and you may dismiss it as looking dead, but I love how it sets off other colors around it so vividly. The real surprise to me on this species is that it is hardy. I'd grown other species of brown sedges as annuals, so when I saw Arrowhead Alpines listing this as hardy here in zone 5 Michigan, I was stunned. They are, as always, totally correct. Sails through every winter without a scratch. For something completely different, tough, and care-free, give it a try. Okay, full disclosure: This isn't in my garden yet, though I've got seeds on order. I fell hard for this little beauty at the Indianapolis Museum of Art gardens, where it was self-sowing enthusiastically through a lovely shade garden. I'm not a big fan of they typical Impatiens walleriana, all dumpy little lumps of flowers. This one is a completely different beast: a looser, more natural looking habit between one and two feet, and loaded with marvelously intricate blooms. Everything I've heard and saw in the gardens tells me that it is perhaps an overly enthusiastic self-sower, but the nice thing about impatients is they are soft and easy to uproot where not needed. Hopefully my seeds will germinate without any fuss, and I'll be able to establish them in my garden. I'll keep you updated. I've got more favorites coming, so stay tuned for the other things I loved last year! In case you missed it, there is new research out on yet another possible cause of Colony Collapse Disorder killing honey bees. This time it is a parasitic fly. Previously, researchers have also found a fungus and a virus that, together, seem to be another major contributing factor. Stress from infections with varoa and tracheal mites may well be increasing susceptibility to these other problems as well. The picture that is emerging is not of one single cause, but a network of interacting pests and disease that are taking the hives down. And this growing group of bee problems may well have at their root a perennially problematic part of modern agriculture: monoculture. Virtually all of our food today is grown in giant fields of a single plant variety. 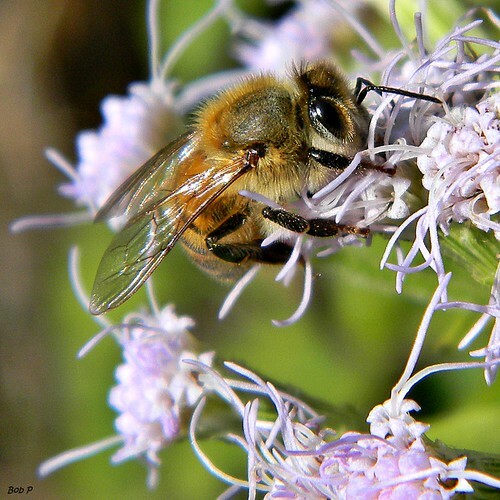 Where those plants need bees to pollinate them, that presents a problem. Take almonds for an example. For just a brief time each spring, acres and acres of almond trees are in flower in California, and they all need bees in order to make almonds. All that bloom is a giant bonanza of food for any bee in the area, but all the rest of the year, they are a wasteland, because there are almost no other plants to bloom at different times and support the bees once the almond bloom is over. So bees get shipped in, huge truck loads of them criss-cross the country moving from field to field as different crops come into bloom. All that moving around works very well to effective pollinate the crops, but it makes for a major problem. New pest and disease show up all the time, that is the nature of the world. Pathogens evolve and migrate, and their hosts evolve to tolerate and resist them. We've seen this already with the older mite problems with bees. At first it was devastating, but newer bee strains are more and more resistant thanks to breeding and simple old fashioned natural selection. But when bees move around so much, they move with them all their local pests and diseases. The very pattern of colony collapse disorder – many problems, each individually more or less manageable, but devastating in their sum – is exactly what we would expect from this sort of mass movement of bee hives. Every new problem can become, almost instantly a national, even global problem, and join forces with other pests before the bees have a chance to develop resistance.